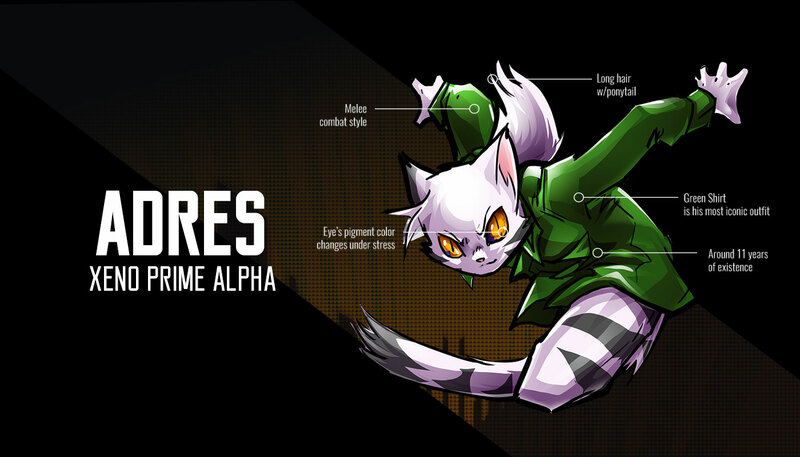 Adres is a genetically modified anthropomorphic cat created by The Consortium and is the main character of the Derideal webcomic. Naive, friendly and peaceful most of the time. Altered Genetics: improved reflexes, strength, speed and immune system. Health Regeneration: Adres can heal his wounds and regenerate tissue fast. Frenzy: Adres looses control when taking too much damage or when his regeneration is triggered. He can’t feel any kind of pain when in frenzy state, which allows him to keep fighting even at the edge of death. 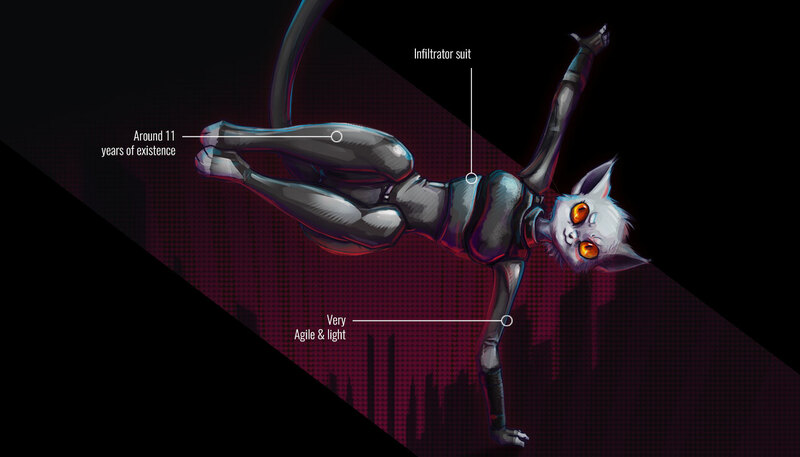 Laura is an anthropomorphic cat created secretly by a scientist involved in the Project Prime, she was hidden by the scientist outside the laboratory for years. Laura is shy and insecure, she tries to hide it by showing herself to be strong to others. She’s very smart. Altered genetics: Improved reflexes, resistance and immune system. Laura was raised and educated by somebody she calls “Father” and knows the human culture perfectly. She could have had a normal life until discovered by the Consortium. Carlos Wally is the main antagonist of the Derideal webcomic. He was forced to step up as the main scientist in charge of the Project Prime. 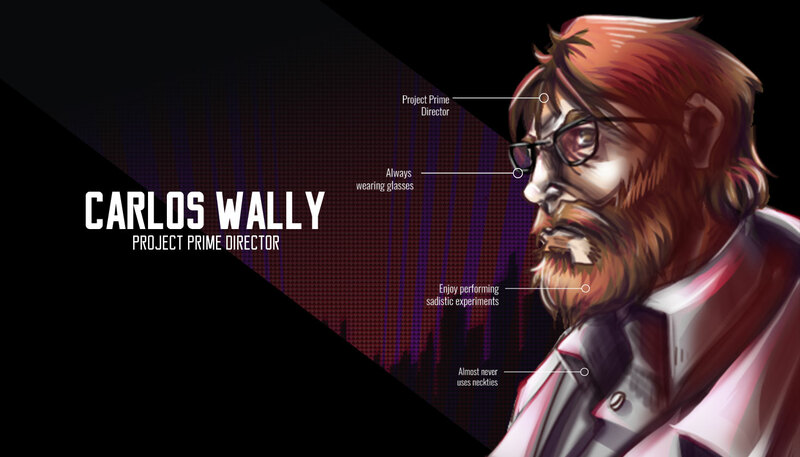 Serious and authoritarian, C. Wally is feared even among the Consortium Scientists. He doesn’t show much pity or morals towards non-human creatures. Wally believes Consortium resources should be used to improve the human being. Daniel is the second in charge in all work related to Project Prime. Daniel is a very responsible person and has a good temper compared to the other scientist working on Project Prime. Daniel was originally C.Wallys helper during the first stages of the Prime experiment. 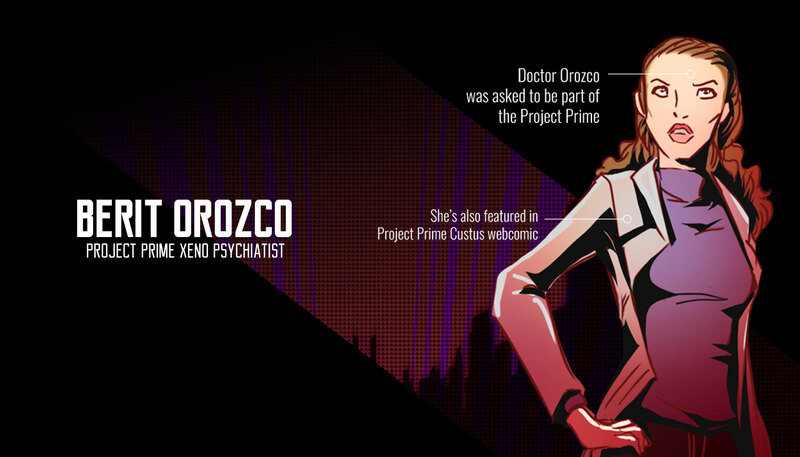 Doctor Orozco is a skilled psychiatrist, she was brought to Project Prime in order to study the Xeno psychology and develop a way to ensure their obedience. Doctor Orozco is after cold science and would like to test the Xenos minds limits . 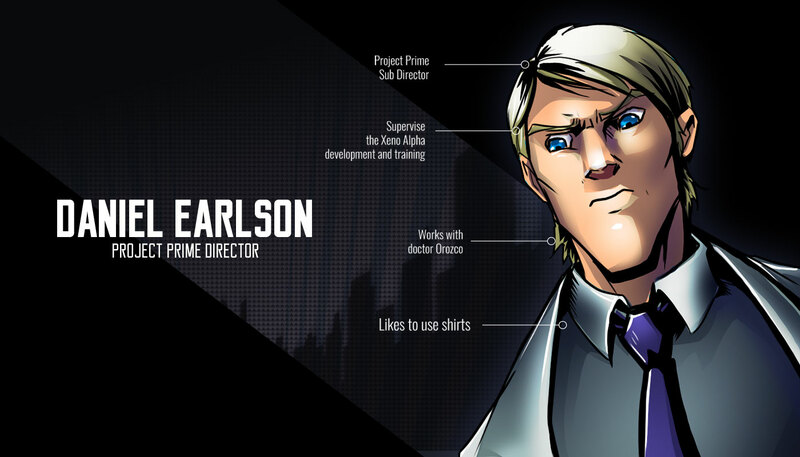 Doctor Orozco is also seen in Project Prime-Custus webcomic. 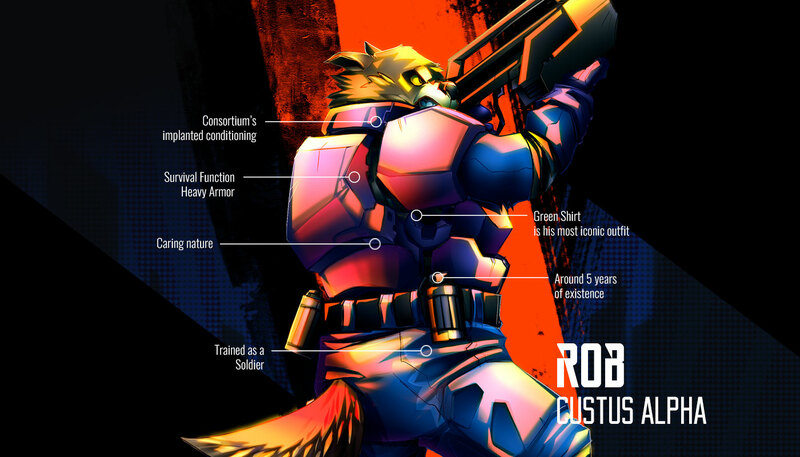 Rob is an anthropomorphic dog created by The Consortium as a prototype for a new canine Xeno race and he’s the protagonist of the Project Prime Custus webcomic. Rob is friendly and not so bright, he also gets fond of his partners quickly. Altered Genetics: Improved strength and resistance. Health Regeneration: Rob can heal his wounds faster than normal. Rob is a very robust dog originally created to execute guard duty, he’s supposedly more influenceable and loyal than Primes due to his conditioning and lower intelligence. Kitty is one of the very first Prime Beta 3 units and was remarkable as the most skilled hunter. Kitty was the name given to her by Rob, her actual name is Beta 3-8.